When I made this meal, I was working without a net. I’ve finally gotten to the point where I can do some minimally complicated stuff without consulting a recipe. Most of the work involved took place the day before I served the meal. Pomodori al Forno was one of the first things I made when I started the project to expand my cooking repertoire beyond the basic meat and potatoes dishes I was used to making. It tasted so good that I’ve made it dozens of times since then. I prepared it by halving plum tomatoes and slow-roasting them with oregano, sugar, and drizzled olive oil, then layering them in a bowl, with parsley and minced garlic between each layer. I poured the olive oil mixture on top of the tomatoes. After letting them rest on a shelf for a couple of hours, I refrigerated them overnight. I prepped the chicken overnight in a marinade of olive oil, lemon, and thyme. The next day, I brought the tomatoes back to room temperature while I was baking the chicken at 350° for a little less than an hour. For each tomato half, I toasted a thick baguette slice in the broiler, then slathered Bûcheron (goat cheese) on top of each slice. The tomato went on top of that, along with a spoonful of the marinade. 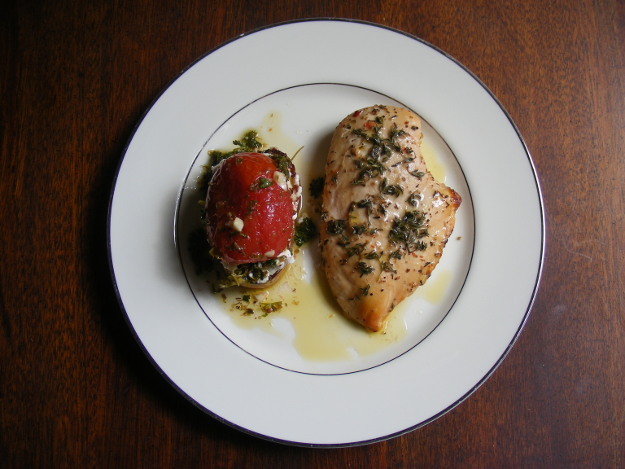 This entry was posted in 2018 Cookery Project, Home Meals and tagged Chicken with Lemon Marinade, Lunch, Pomodori al Forno on 9 March 2018 by bcarter3.